I’ve quit believing in coincidence. When seemingly random events culminate in a meaningful way, providence is my line now. Such was the case when I was searching the Great River Regional Library website for an audiobook to accompany me to and from Michigan over Divine Mercy weekend. I searched for several titles by name, and several topics by keyword, to little avail. 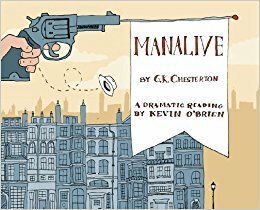 Then I stumbled across an audio version of G.K. Chesterton’s Manalive, narrated by athiest-turned-Catholic and Theater of the Word founder and actor Kevin O’Brien. I didn’t know what the story was about. That it was Chesterton told me it should be good — but as I’ve said before, Chesterton can be too clever by half at times, and I’d never tried his fiction before. I put in a request for this book and for Mark Twain’s biography of St. Joan of Arc, and Manalive arrived first. I hesitate to say too much. It is the story of an apparent madman or idiot who invades a British boarding house and turns the humdrum lives of the inhabitants upside down. Ultimately, he is accused of insanity, theft, polygamy, and murder – but how can a man as wicked as that make others feel so alive for the first time in years? Like Myles Connolly’s Mr. Blue, which I reread over Holy Week, the book portrays a man who had dedicated himself to a worldview that the world has little use for and who pursues it at whatever cost. As a result, he makes us think about our own worldview and priorities. Manalive is chock full of great Chesterton quotes and paradoxes and memorable characters made moreso by O’Brien’s theatrical reading, voicing each of the characters as clearly as if he were several people himself. By way of criticism: The work does wax poetic at times – particularly the introductory chapter – and at all times Chesterton’s presence is felt in the thoughts, wit, and turn of phrase of the characters. I would also be remiss in not pointing out Chesterton’s use of racial and ethnic stereotypes and language, particularly in drawing the character of Moses Gould. In the context of this story, it was unsettling, but it struck me more as a product of his time than of strong personal animus. As to his actual views of minorities, I need to read more. By way of endorsement: I listened to it start to finish on the way to Michigan, again on the way home from Michigan, and yet again on the trip back from Florida with Rose and Trev. It has climbed to the upper heights of my list of favorite stories — and if you want a fictitious explanation for why I’m leaving a good job at the church for a nebulous next step involving writing, this is it. I could not have stumbled across a better novel to bolster and encourage me in this time of transition. First off, my congratulations on your review. I read Manalive any other month or so, and I'm always happy to read another opinion. I have to say I agree with what you write. Not wanting to do an excessive – and sterile – praise, I emphasize that writing of “racial and ethnic stereotypes and language” in Chesterton is objectively wrong. Perhaps you got confused, because that IS Gilbert, positions like that make of him the best journalist, thinker, writer and kind of friend of all.